It must seem like a wondrous fantasy of salvation to modern journalists waiting for the ax to fall on an entire industry— a government program to pay writers to write! Alas, the 1930s Federal Writers Project was the sort of idealistic New Deal-era folly our hardened age would find too frivolous to spend money on, unlike more practical fictions such as credit default swaps or a viable American auto industry. Auto workers actually have to be paid to make cars, but as the internet has proven, writers will crank it out no matter what. …that is, if you don’t count the previous anthology made out of the same material, and at least one book collecting a specific writer’s contributions to the project. So if this isn’t quite the unknown treasure trove claimed, it’s still a rich slice of one of the major food projects of the previous century, and one of the earliest records of foodways around the nation. For this foodie age, it’s not only a picture of our cuisine’s prehistory B.C. (Before Child, Julia), but a record of how people thought about food before people thought as much about food as we do, or at least in the particular way we do. The book is, unsurprisingly, organized regionally; and it starts, unfortunately, in the northeast, a section which proves a bit colorless when it comes to food. America Eats! had already used the better of two pieces on a Vermont May breakfast, and the one that’s left sums up the boringness of the flinty Yankee palate perfectly (“Among other things served at that first breakfast was cold boiled ham”). It only comes to life in gleaming Art Deco New York, where we get a snarkily droll account of a literary tea (“If the party happens to be given in honor of a new author, he is almost always completly ignored”), and a well-observed piece on drugstore lunch counters that includes news of a new dish, hyphenated as if T. Herman Zweibel were writing, called the cheese-burger (“a doughty bit combining grilled hamburger and melted American cheese served on a soft bun and tasty enough to ensnare even the one-cylinder appetite”). Most usefully to the author of imitation hardboiled fiction, there’s an extensive glossary of classic diner slang, such as Bay State Bum (a demanding lousy tipper), Guinea Footballs (jelly doughnuts), or Two Cackles in Oink (ham and eggs). 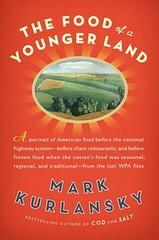 This is the part of the book that fulfills the idea of a lost American food culture, full of exotically named delights (Mississippi Mullet Salad, Georgia Possum and Taters, South Carolina Pee Dee Fish Stew) and, more to the point, a rich social dimension to how food is made and consumed in large groups. It’s also the part that truly seems to care about how you make the food; where the New England section could be frustratingly cryptic about recipes, here the detailed descriptions are loving and meticulous. It is hard not to conclude that this is the part of America where food matters, has always mattered, as more than mere sustenance. The Midwest portion is missing some sections (Chicago, for instance, somehow vanished from the surviving manuscripts) and some of what’s left reads like parody of its food’s legendary plainness— the first piece on Kansas seems designed to convince you it’s the most boring steak-and-potatoes place on earth. There’s also a definite tendency to overwrite here, as if to make up for the drabness of the subject— Nelson Algren’s would-be intro to the section is a clumsy clip-job of the info presented in the actual pieces. And William L. White— son of the smalltown editor William Allen White, and famous for the European airs he put on after working as a foreign correspondent— affects a rowdy rusticness in the other major piece on Kansas that sounds like a city dude trying to play a tall-hat rancher. A lot of the Midwest section is devoted to what the Indians ate before the white man, and the same is true of the Southwest section, which, as the area was pretty unpopulated, would be quite short if Southern California weren’t shoehorned in. The best of this part is a surprisingly thorough picture of the basics of Mexican-American cooking, introducing the cheese-burger’s great rival for the hearts of late 20th century Americans, “a sandwich called the taco: a tortilla fluttered through hot grease, folded around shrimp, sausage, and chili stew, garnished with shredded lettuces and grated cheese.” The remaining section, covering the west and northwest, gives just a modest preview of the impact this region would have on American dining in the postwar era, mainly conjuring up a half-lost world of plentiful seafood like geoducks and salmon. It does offer two of the quirkiest pieces; one is a three-page rant against inferior ways of making mashed potatoes, and the other is sympathetic account of the choices in industrial alcohol products available to skid row sterno bums, which reads like a parody of connoisseurship (“a new type of tippler now tops all in drinking bravado, according to Portland police. His drink is a mixture of gasoline and evaporated milk”). Mexicans come off pretty well, and so do blacks, thanks to the regional division of the book. Otherwise ethnic cuisine is pretty much ignored, save for the occasional ringer (some Scandinavian material from the midwest, a piece on Basques in Idaho). You’ll look in vain for New York deli or Providence red-sauce Italian; this is a book about the old WASP culture. Of course, fast food doesn’t exist yet (those nascent cheese-burgers and tacos are just harbingers from the future) and there’s little mention of restaurants at all outside the New York and Los Angeles sections; “famous chef” is very nearly an oxymoron in these days. Mostly this is a book about social gatherings, as that would be the main occasion when rural Americans (and the country was still about evenly rural and urban then) escaped a subsistence diet (like the “corn-dodger” bread described in one piece) and managed to eat, well, high on the hog. We tend to be convinced that the generation or two before us spent less time consuming media and more time interacting with people, but this book is so filled with affection for church suppers, barbecue struts, Nebraska bison roasts, police widow benefit potlucks and the like that you start to wonder, did they feel like the golden age of food togetherness had been just before their time, too? Were they regretting the time they spent listening to Amos & Andy and thinking they should have been out catching possums for a burgoo? On the evidence of this book, America has been bowling alone for longer than we may realize, and the social events that bring us together over food at its most dressed up have always been the cherished exception, not the everyday rule.